SABATO: Virginia is now a blue state. We’ve been calling it kind of purple competitive. We’ll just go ahead and call it blue. It’s not as deep blue as California or New York or Maryland, but it’s blue. So you would expect a Democrat to be elected when there’s a Republican president, particularly when the GOP president is unpopular, and he is unpopular in Virginia. He’s popular in red states, but he’s not popular in blue states. Everybody asked me, “Well, does this mean that Democrats will sweep in 2018?” I don’t know. We have a whole year to go. There will be a hundred big things that happen between now and then that could change perceptions. RUSH: Holy smokes! I don’t believe it. SABATO: Anybody who predicts 2018 on the basis of 2017 can be embarrassed. RUSH: I’ve gotta applaud Larry Sabato! SABATO: I would urge them not to do so. “The American people are finally awakened. They see Trump for what he is: A total reprobate pig. The American people regret electing him. The American people have buyer’s remorse. The American people now realize the Democrats is the answer to everybody’s problems, yada yada yada,” and Sabato’s point’s right on the money: Virginia is a blue state where you’d expect what happened yesterday to happen. It’s not a surprise! The surprise would have been… Trump didn’t win Virginia; Hillary did. 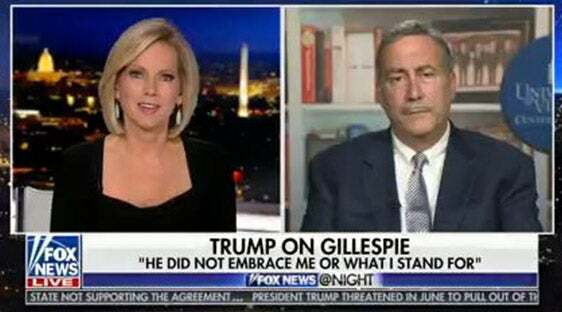 It would have been a surprise if Gillespie had won. Gillespie didn’t do anything to win. Look, I don’t want to start dumping on these guys. They’ve got enough problems as it is. But there’s no way that you can Trump’s policies and somehow avoid embracing Trump. Our guys try to thread this needle in I don’t know how many different ways not just this elections but supporting various pieces of legislation or what they say to the media. They’ve got it in their heads that everybody hates Trump. But a lot of people like what Trump’s doing. I mean, look at the economy. You look at outward signs and what people’s opinions of things in the country are right now. Look at the consumer confidence. It’s near a record high. There’s all kinds of upbeat cultural polling data out there. The left is cratering and falling apart because every damn one of them is being revealed to be a reprobate now, in Hollywood and in the media movie business. I mean, look. The latest is Charlie Sheen with Corey Haim — or Haim, however he pronounces it. I mean, it’s a thick cesspool out there. There’s nothing redeeming about it, and it’s all Democrat all the time. The idea here that the country hates Trump is silly. There’s so much contradiction. The Trump approval numbers are in the thirties, 38%, whatever. And yet consumer confidence is at an all-time high. The poll that we had, I think it was either early this week or late last week where people said more people than in the last 20 years said they think they can reach and realize the American dream. Well, somebody explain to me how all this gets combined in ways that make sense. If they hate Trump and they disapprove of the job Trump is doing, yet they embrace what are obvious Trump policies… I mean, these things are happening are not coming from Democrats, and these things that are happening are not coming from Republicans. There isn’t any leadership in either party on the things that are happening now to improve the American economy. We are serious about the immigration issue. We’re serious about Obamacare. We’ve tried to repeal Obamacare — I mean, Trump has. Trump vocally, verbally has been very, very up front about it, like he is on every issue that he espouses. So we have Trump highly unpopular, in the 59, 58% territory; 38% approval. And yet the issues that are defined or attached to Trump, people approve of and are saying so. So what explains this? Now, the Democrats want you to believe that the country hates Trump and that’s what the election meant last night, and I think there are too many Republicans that buy into that as well. Here, next sound bite. This is a… Bloomberg’s national correspondent Joshua Green with Chris Cillizza at CNN. They’re talking about, again, the Virginia governor’s election. GREEN: Democrats turn out their vote tonight everywhere! GREEN: — and that is gonna be key going into 2018. GREEN: — I don’t think it’s wrong. RUSH: Hatred for Trump. Hatred for Trump. Yeah, in a Democrat base, but they’re trying to tell us the hatred for Trump goes way beyond the Democrat base. But it doesn’t make any sense, with everything else that you see happening in the economy and things that Trump is responsible for and makes no secret about the fact that he’s claiming credit for them. Back to the phones we go. Michael in Branford, Connecticut. Glad you waited, sir. How you doing? RUSH: Hello, anybody there? Testing, one, two, three. RUSH: I think he’s listening on a delay and he doesn’t know we’re here. Take him down. We’ll go somewhere else. Keep him there; see if he comes back. James, Danville, Virginia. Hello, sir. CALLER: How are you doing, Mr. Limbaugh? CALLER: Honor to talk to you. CALLER: I don’t think this was a referendum on President Trump. It’s more along the lines of just — as usual — northern Virginia and now that they’ve got the population numbers on the East Coast just overrode the rest of the voice of Virginia, because the rest of us is rural. And they’ve got the numbers, so they can override the voice of the rest of the state. CALLER: And last night when I was listening to Chris Stirewalt, he even pointed out that if you were to take away the northern Virginia right around the Beltway area vote, Trump would have won Virginia by three points. RUSH: Yeah, but you can’t do that. CALLER: I know. It’s just the point of those people in that area that work in that D.C. area that have built up that population. RUSH: So you’re saying what that means is that this is not a referendum on Trump. It was just the numbers are no way gonna favor a Republican anywhere in that state? RUSH: Well, look, the numbers don’t lie, but there are people behind those numbers. And, however the numbers fall, in Virginia they fall to make it a blue state, those people did vote against Trump. I mean, there’s no question. They do hate Trump. They viscerally hate Donald. And the closer you get to the Washington establishment, the greater the hate. They do hate him. So in that sense, it is a referendum on Trump. It’s not a referendum on Trump’s policies ’cause they don’t care about Trump policies. If Trump had resounding success on everything he wanted to do and if the country was already in demonstrably better shape, they would still vote against the guy because they despise him for a host of reasons. They despise him because he won. They despise him ’cause they hate his personality. Folks, I don’t know how cognizant of this — I was talking about this with some people recently, but the dramatic and the seemingly overnight shift in the personality makeup of your average American liberal to me has been profound. I remember all of my life growing up into various ages, into my twenties and thirties, there were always Democrats, and there were always liberals, but the liberal Democrats were never as focused on the things they’re focused on today. Feelings — it was always there. I’m just saying it’s been exaggerated now to the point that these people are unrecognizable to me. They’re all snowflakes. They’re all sitting out there with wounded feelings if anybody says one thing they disagree with or don’t like. There doesn’t seem to be any rationality to these people at all. And there is no Democrat Party that existed when I was in my twenties and thirties. The Democrat Party of JFK and LBJ is gone. The Democrat Party of George McGovern is gone. The Democrat Party, even go back to the eighties, you know, Walter Mondale, Jimmy Carter, that’s not the Democrat Party today. The Democrat Party today has been taken over by — wish I could think of a single-word description. But it is widespread. It’s like the far, unhinged left has taken over all the Democrat Party, rather than the Democrat Party absorbing these people and including them. It seemingly happened overnight, to me, just in my awareness of it. I know it’s been trending for a long time. It seemed like with the election of Obama — you go back to the eight years of Bush, I mean, we had Bush hatred and all that, but it wasn’t on the surface the characteristics, the character identification, the tendencies, the personalities. I’m trying to avoid using some words here so I may not be communicating accurately what I think. But it’s mind-boggling to me how it has mushroomed and grown to the point that the Democrat Party is largely a bunch of people who have active, ongoing, expanding grievances of real hatred and anger toward their own country. And so anybody like Trump who comes along and loves his country and speaks unabashedly proudly of his country and talks with strength and confidence, the characteristics that used to attract people, the characteristics that used to be a magnet, the characteristics that used to define what it meant to be an American are the very things that infuriate these people and scare them, frighten them to death, and enrage them. And the Democrat Party is catering 150% to them. RUSH: This is Bill in Cape Coral, Florida. Thank you for waiting, sir. What’s up? What’s happening? CALLER: Hey, Rush, great to talk to you. First-time caller. I was just curious, I didn’t hear it talked about anywhere, how much difference it made that Terry McAuliffe allowed the felons to vote in this election? RUSH: I think it’s huge. I think it’s huge. In fact, I’ve got it near the top of my Stack today, which I was gonna get into at the top of the next hour and you have provided the transition. So I want to give you credit. Bill is right on the money. Listen to this. This is a Breitbart story from back in July of 2015, so over two years ago. Headline: “New California: Mass Immigration Turning Virginia Blue.” Now, this article turns out to be 14 pages. It’s about how overrun Virginia is, purposefully, with illegal aliens and that it is a plan that dates back years. This story is two years old, don’t forget. Let me give you a pull quote. The Washington Post reported in 2011: “Soaring number of Hispanics and Asians pushed Virginia’s population over 8 million in the past decade.” Asians means Muslims, not people from China or South Korea or Japan. You have to know how to read this stuff. Hispanics and Asians mean Democrats, people that vote for the administrative state. Then the next story — and this is from a year ago as well. Saturday, November 5th, 2016: “In Virginia, Ex-Felons Find Empowerment in the Voting Booth.” In April of 2016, Terry McAuliffe, the Democrat governor, signed an executive order to restore voting rights to more than 200,000 convicted felons. So if you couple the purposeful flooding of Virginia with illegal immigrants from specific parts of the world with McAuliffe legalizing the vote for felons, convicted felons, 200,000 people — this is what I meant earlier with the various machinations that McAuliffe had put in place to secure election results even before Election Day hit.